The notification system in Windows 10 lets the user know of a notification that has just arrived, through notification sounds. These sounds can be useful to attract the attention of the user who might be busy doing something else on the device. This model of notification sounds is better than the earlier Windows 8 pop up toast notifications, and is pretty good as it ensures the user gets messages or notifications he or she may have previously missed. But several users complain that the sounds that chime along with the notifications, are annoying. 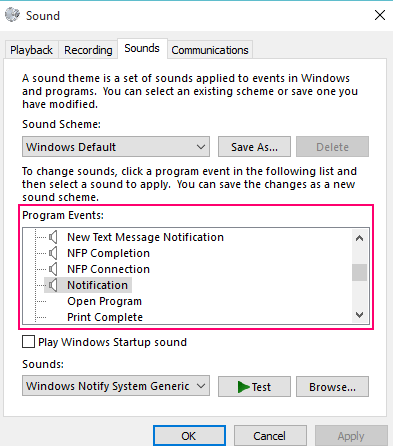 Notification sounds are heard for connecting or disconnecting a USB, a battery warning, and other mundane notifications, so this can get irritating quickly to anybody who frequently uses his or her Windows 10 device. Users have complained of receiving ghost notifications- the system chimes to inform them they have a notification, but when they open it, there is no notification. Also, people have been receiving notifications late sometimes. In that case, being interrupted by frequent chiming of notifications that probably exist or do not exist, there has to be a way to disable the notification sounds permanently. Under PC settings, choose System. After that click on Notifications & Actions in left sidebar. The first set of options here will be under the heading Notifications. Go to Play notification sounds (the third sub heading) and move the slider to Off. 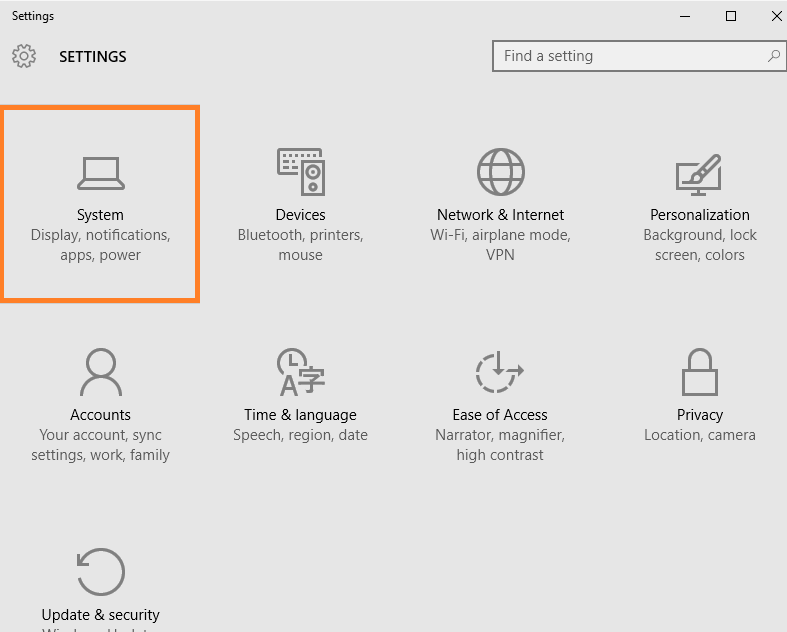 The slider will always be on by default when you begin to access your Windows 10 device. 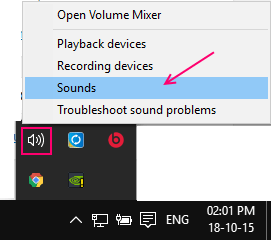 First do a right Click on Sound icon in the notification area or taskbar. 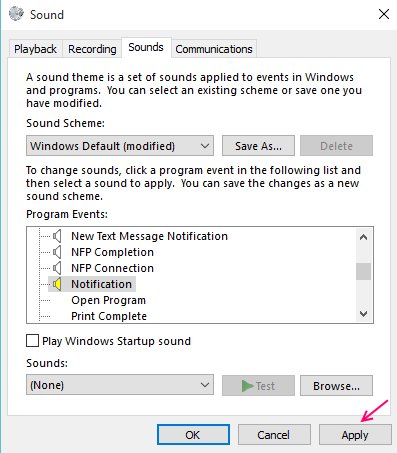 Choose Sounds tab, and select Notification from under the Program Events list. Under the list box, there will be a Sounds drop down menu. 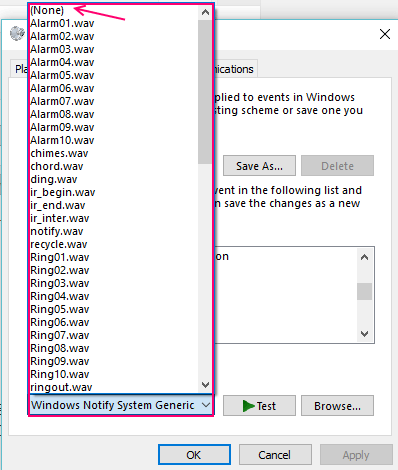 Select None under this, and click on OK.
For those users who don’t want to turn all sounds off, or all notification sounds off for that matter, they can easily change the individual Sound settings as well. 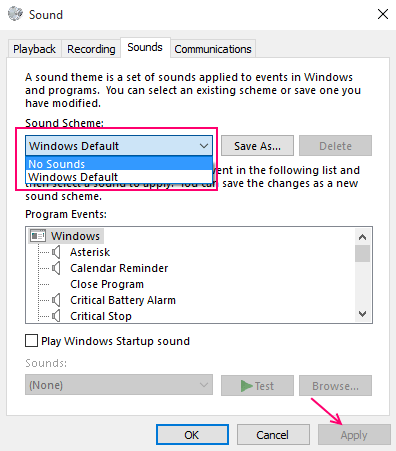 Just choose settings which you want to turn off or change the sound from program events list. Then choose sounds as desired from the list as shown. For muting notification just choose no sound from the dropdown. 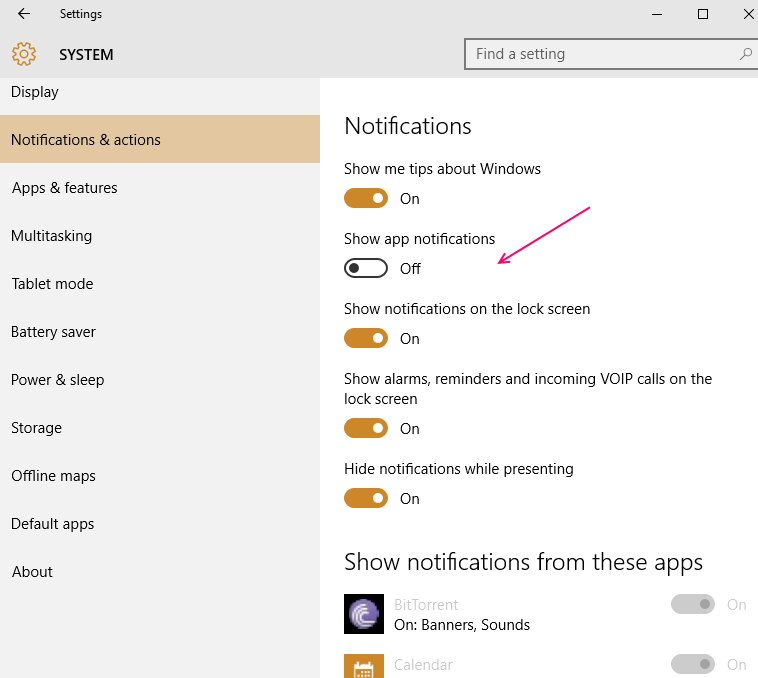 Disabling notification sounds won’t stop the notifications themselves from coming in though, so if you want to disable notifications altogether, just toggle Show app notifications to Off under PC settings. You can click on Notifications and Actions. Under Notifications, the user can slide Show app notifications to Off, and that’ll do the trick. The user can choose particular apps for which the system will be allowed to show or not show notifications as well, right under “Show notifications from these apps” in the Notifications and actions option itself. To customize the notifications for each app, just click on the name of the app. Turn on or turn off whatever settings you wish to use, or don’t want to use. Do the same for any and every app you want to edit or disable notifications for.